So, way back in the early days of Suncoast Diecasters, I was lookin’ over the cars on Ken’s table. I spotted this van, see; it was long and lean, kinda futuristic lookin’, with a big spoiler over the back. I picked it up and said, “Spoiler Sport, right?” Ken takes it and turns it around to show me the big bumper on the rear: “Nope!”, he says, “Saturn Seeker! 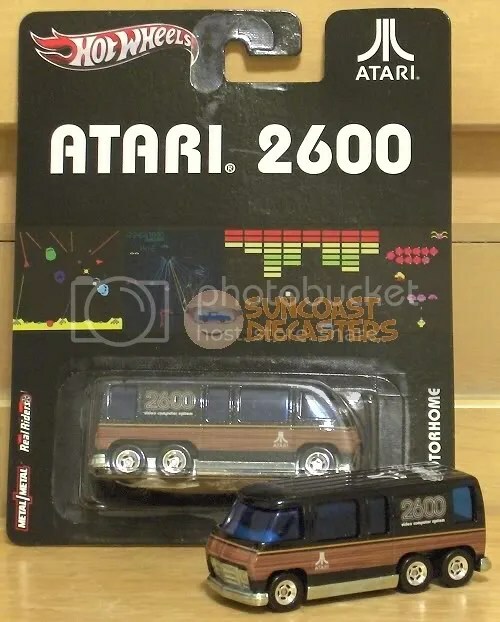 It’s a Fast111s, by Kenner!” Oh, wow. I had completely forgotten about Fast111s. Heck, I had completely forgotten about Kenner! I recall a weekend when my high school buddy Jeff and I had gone to the mall, and he picked up some Fast111s. He informed me about the rear bumper, the license plates, etc. I don’t know why I didn’t get into collecting them, other than I guess I wasn’t particularly collecting anything at that time. I bought that Seeker from Ken that day. Since then, over time, one by one (and moreso), Fast111s have been showing up at our meetings, and I have been dutifully collecting them. Now, be honest: it was pretty easy for me to make that mistake in guessing the name, wasn’t it? Odd thing is, this isn’t really a van, despite its cabin-like shape. It’s a two-seater. I couldn’t get a satisfactory photo of the interior, but I assure there’s only two seats in there. And in this photo, you can see the gap which outlines the “canopy”. In this shot you can see two of the three reasons why Fast111s didn’t have great success on the market. First, the bumper. Looks okay on the regular, everyday car and truck models. But several F1s are “non-street legal”, such as a dragster and dune buggy, and several are fantasy designs such as the Seeker. The big ol’ clunky bumper, with its embedded taillights and license plate, is completely out of place on such models. The second reason is the wheels. Look at ’em: simple and cheap. And the same design is used on just about every model. No “blackwalls vs. Redlines” challenges here. So what we have here is a clearly futuristic two-seater, with a massive engine and dual rear axles. 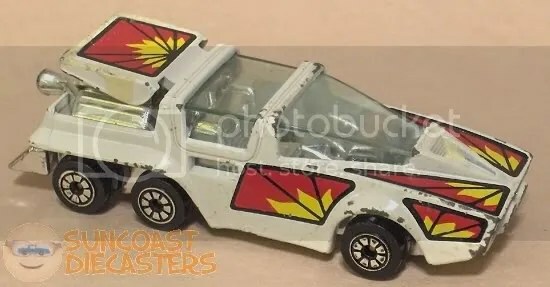 I have no way of proving this, but I’m suspecting that Saturn Seeker’s designer had envisioned this as perhaps a long-range scout or recon vehicle, in some far-future society or perhaps even on another planet. No way to know, of course. But despite the design flaws inherent throughout the line, Seeker is a very attractive concept / fantasy vehicle. Now, here we have a more recognizable design. 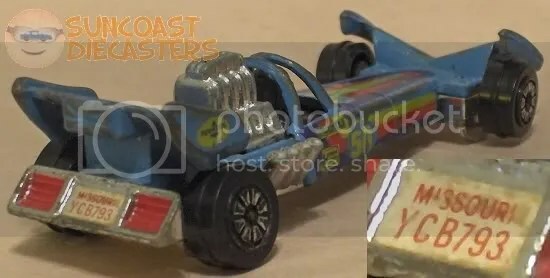 I was going to refer to this as a “typical slingshot” dragster, but brief research suggests it’s more accurate (or less inaccurate) to call this a “top fuel” dragster. In either case, it’s clearly a dragster. Drag King, officially by name. Available also in orange (I think). Close-up of a typical Fast111s wheel. Yes, it has a speedy “whizz wheel”-type ridge around it. But it’s a cheap design, artistically. 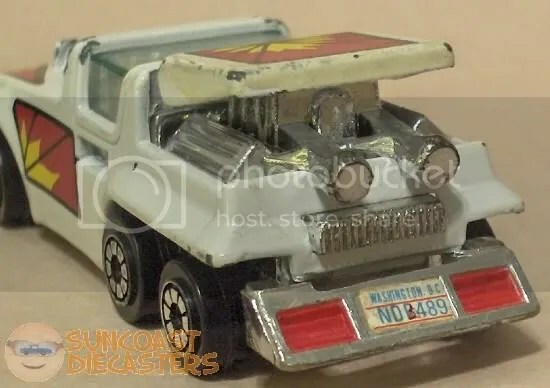 Kenner put some nice creativity and effort into Fast111s’ body designs, yet they slap these low-grade “pie slice” wheels on the cars. 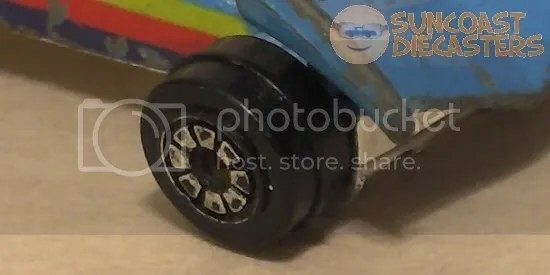 It doesn’t even look like a wheel and hub — at least Hot Wheels’ basic 5SPs and BWs look realistic for their size. Further, aside from the unrealistic design, the hub (such as it is) lies outside plane of the tire face — this certainly lowers cost as it’s easier to paint, but it detracts from the car overall, and negatively impacts collector value. This photo was originally the third, but I’ve decided this a better one with which to close out the set. First, notice that the bumper is hardly even recognizeable in this shot; could be an odd-looking wheelie bar or some other drag-related component from this angle. And as I said above, I really enjoy owning and collecting Fast111s. Look at this machine. Yeah, a bit short for a dragster (but then, the GMC Motorhome is short for a camper). Aside from that, though, it’s a very lean and aggressive design. That front spoiler has an aggressive, scythe-like curve to it. Rear wing could be seated higher but it fits the design overall. 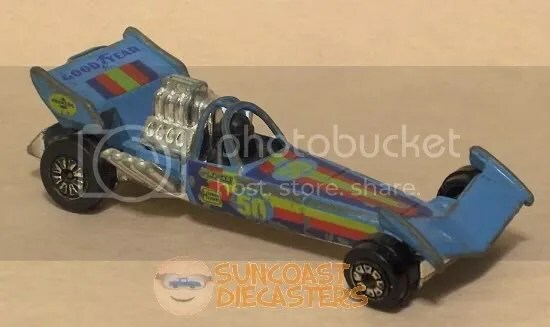 This model would look very good sitting next to Slingshot Dragster and Driven to the Max on your shelf or in your diorama. 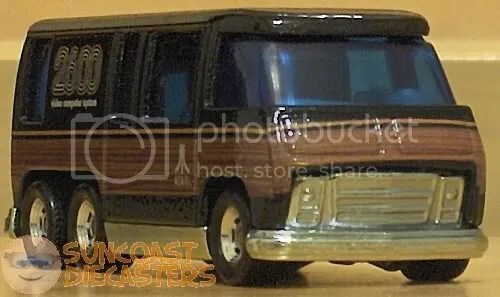 As I had just mentioned the GMC Motorhome in the above entry, let’s take a brief break from talking about Kenner Fast111s to discuss a neat new bit of coolness. November 3rd was the last K-Day of 2012. As I was heading out from the gathering, something curious happened, which I think was the hand of the LORD in action. I noticed an older fellow trying to get my attention. 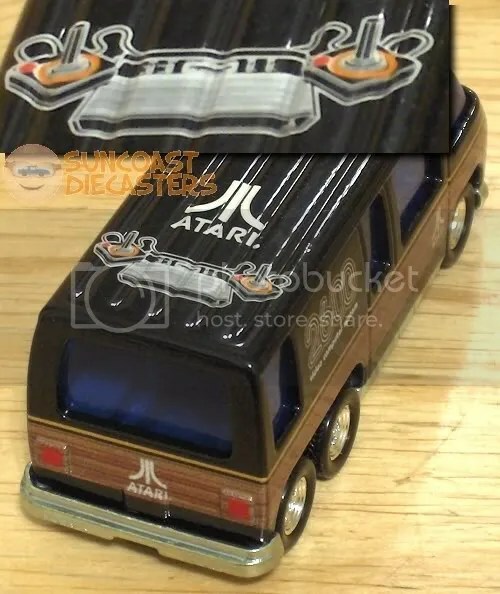 I walked over to him, and he informed me that there was a display case featuring Hot Wheels’ newest Nostalgia series, which features the Atari 2600 Video Game System. 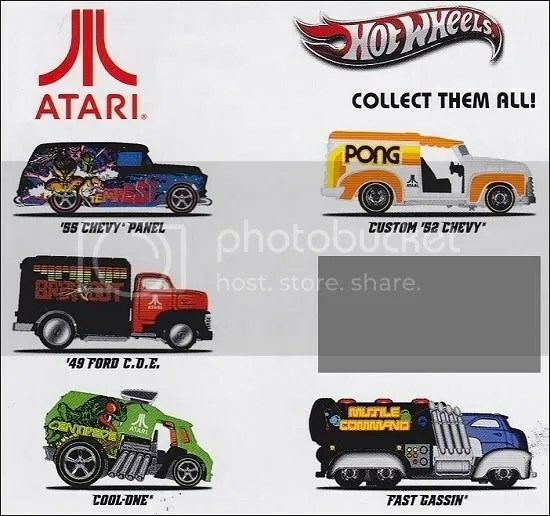 Below is a scan of the card back, listing the vehicles in the series. Now, you’ll note that five of the six are decorated for specific games. But … what of that fellow so mystriously grayed out? What’s the vehicle? What’s the decoration? …Aaaand here’s that close-up I know you’re just drooling for. 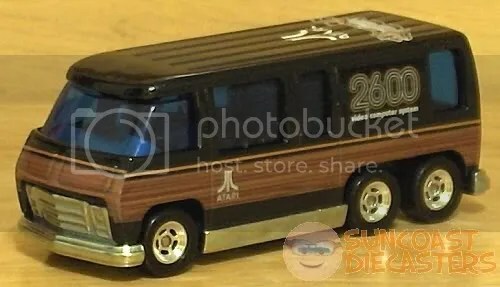 That woodie– er, wood veneer look just works really, really well, IMHO. For those of you who might find the various Atari emblemoi distracting, just do what I do: turn ’em off in your mind, man. Hey, it’s the ’70s. Just switch ’em off in your mind, baby. Click. We close this series with this nice, artsie-phartsie photo. As I said near the top of this run, it’s nearly impossible to predict a high-demand collectible. 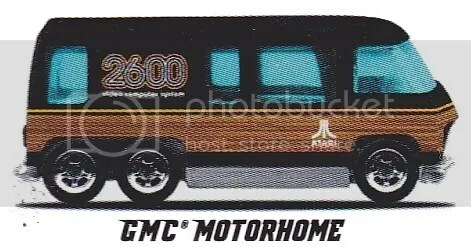 I genuinely think this particular variation of the GMC Motorhome will be that. But even if it’s not, I very much appreciate having such a lovely version in my collection, and I’m very grateful to the LORD for bringing this beautiful item into my life.